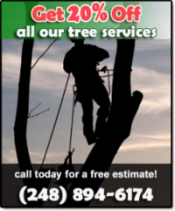 Advanced Arbor Tree Service believes that safety is a way of life. We invest in the safety of our clients, workers, and equipment. Our culture of safety is focused on reducing activities and behaviors that can be deemed “at risk” both on and off the job. Full Walk Around – In order to be more aware our surroundings, our drivers are committed to fully walking around any and all vehicles or equipment before their removal. We also have spotters available for particularly difficult situations. Seat Belts and Harnesses – We require our employees to wear seat belts when they are operating machinery or vehicles. We also require employees to use a full body harness when they are utilizing aerial equipment. Protective Zoning – Our employees use barriers and other required safety equipment to clearly define the work area. Minimum Approach Distance and Drop Zones – Employees are well informed about, and constantly maintain, the minimum approach distance when they are passing between conductors and other devices and equipment. They are also trained to mind the drop zones of respective aerial devices. 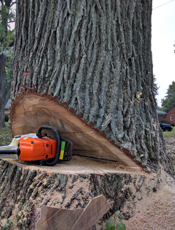 Chainsaw Usage – Employees are required to always use two hands when handling any chainsaw. At Advanced Arbor Tree Service we take great pride in our many vehicles. Our care of the equipment is apparent. When we arrive at your property, you can rest assured that our vehicles will be pristine and presentable. Our employees will also be outfitted with uniforms, as well as the proper safety equipment.